When it comes to conveyor operation, safety should always be a top concern. With more than 50 workplace fatalities a year where conveyors are the primary source of injury and workplace accidents accounting for nearly 25% of all workers’ compensation claims, you must pay attention to industry standard safety practices (see below). Regardless of the type of conveyor being utilized (gravity, belt, power roller, etc. 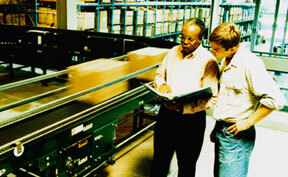 ), there are rules to follow that help reduce conveyor related injuries. DO keep clothing, body parts, and hair away from the conveyor: This is one of the most common conveyor related injuries, and the consequences can be devastating. Trained personnel should keep their hands off conveyors and visitors to your plant should be briefed on conveyor safety and inspected for loose clothes or long hair that could be caught before being allowed near the conveyor line. Don’t wear watches, bracelets, or rings either. DON’T climb, step, sit, or stand the conveyor at any time: It may seem like common sense, but people frequently do it, and it can lead to serious injury. It’s imperative that workers never climb, sit, stand, walk, ride, or even touch the conveyor line. 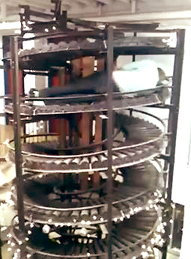 People ride conveyors because it looks fun, and because it doesn’t seem as dangerous as it is. They’ve even seen it done in action movies. But conveyors are not built with people in mind. Pinch points can exist that can catch clothing or people, and cause serious injuries. Capacities are not designed for a human’s weight. There are many ways for conveyors to cause injuries to anyone who sits on them. Aside from the safety factor, people riding on conveyors can cause belts to un-track or damage the system. DO ensure all personnel are clear of equipment before starting: OSHA conveyor standards state that conveyor systems should be equipped with a warning signal to be sounded prior to start-up. But companies should not stop there; training should also be included about what the warning horn means and how injuries can occur if it’s ignored. DON’T remove or alter conveyor guards or safety divides: Guards may be removed by plant employees or service contractors for maintenance, which can expose machinery, gears, chains, and moving parts that can be dangerous if left unguarded. To help ensure worker safety, lock out conveyors when in service, and operate equipment only when all approved covers and guards have been reinstalled. DO know location and function of stop/start controls: It’s imperative that anyone who works in a conveyor area be familiar with the location and function of emergency stop and start controls. Employers should train workers about the controls, where they are, when to use them, and how to access them, and the controls should also be marked to avoid confusion and allow workers to make fast decisions about using them. More information: Conveyor emergency stops are vital. DON’T perform service on a conveyor until motor disconnect is locked out: Avoid performing any maintenance until electrical, air, or hydraulic power sources are disconnected or blocked out. Lockout/Tagout systems can prevent equipment from being powered up while maintenance or repairs are being done. DO allow authorized personnel to operate/maintain material handling equipment: Only those employees who have been trained to operate and perform maintenance on conveyors should do so. This ensures both technician safety and optimal conveyor performance (note: Cisco-Eagle offers professional conveyor maintenance in some geographic areas). DON’T modify or misuse conveyor controls: Conveyor controls should never be modified by unqualified personnel. Be sure to monitor your controls to ensure no employee has misused, modified, or disconnected them. At times employees can make modifications that work for a specific area or function, but can contribute to a less safe working environment. Be sure that they understand that conveyor controls are typically part of a larger system, and that any changes must be approved by management. DO make conveyor safety training a priority: Any facility that utilizes conveyors should train employees in safe operations. Regular, frequent updates and refresher courses should be included in the training program and preventing unsafe acts should be a part of company culture. Visitors should also be informed of safe behavior standards if they are going to be near conveyors. DON’T fail to report all unsafe conditions to your supervisor: Your company culture of safety should encourage workers to report unsafe conditions like loose guards, people working too closely with the conveyors with unrestrained clothes or hair, etc. Training about safety issues and when to report them should be made to all employees and repeated often. Allow anonymous or “no consequences” information submissions when it comes to safe situations and behavior; the main thing is to be sure unsafe practices, equipment, or people are reported and dealt with in a way that helps make the conveying equipment safer for everyone. Since conveyors of all types have many moving parts, anyone who works on, near, or around them should be well versed in conveyor safety and understand why each of the above rules is important any necessary. Making safety a priority could mean the difference between a workplace injury and a productive, efficient working environment.